Forget the conspiracy theories that claim Martin Luther King Jr.'s assassination was the result of a government plot. Lyndon Johnson, the Joint Chiefs of Staff, and the FBI had nothing to do with it. 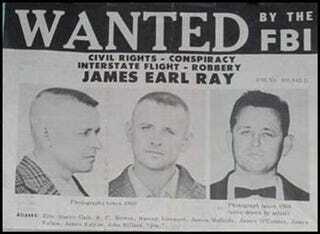 James Earl Ray killed King. If any organization was involved, it was more likely the KKK than the CIA. That's the conclusion I've reached after decades of pondering every scrap of information I could find about King's murder, including the so-called proof about a supposed high-level government plot put forth by King's family and Ray's last attorney, William F. Pepper. There's not enough space to go into all of the evidence that points the finger squarely at Ray. It includes the undisputed facts that he bought the rifle that was found at the scene of the crime, rented a room that overlooked King's motel and had been stalking his victim for weeks. (For an exhaustive and thoroughly convincing rebuttal of conspiratorial speculations about the case, check out Killing The Dream by Gerald Posner. But the main reasons for my skepticism about the conspiracy theories are two essential truths that some people just can't seem to grasp: It didn't make a massive movement of troops, intelligence agencies and Mafia hit men to do away with the revered civil rights leaders. And there was a group deeply engaged in the systematic murder of uppity blacks like King. It was called the Ku Klux Klan. The simple fact is that killing King would have been easy, almost routine. He had no bodyguard or police protection. His whereabouts in Memphis on the day he was killed had been published in the local news media. The Lorraine Motel, where he was slain, had an exposed concrete walkway where he would have been vulnerable to being shot from a nearby flophouse where Ray had a room. All a concealed gunman had to do was aim, pull the trigger and get away in the confusion. I believe that's what Ray did. Lone gunmen have perpetrated plenty of political shootings. Five years before King was cut down , a Klansman named Byron de la Beckwith slaughtered NAACP Field Secretary Medgar Evers as he got out of his car at his home in Jackson, Mississippi. De la Beckwith was acting alone. So was a nut case named John Hinckley, who nearly killed Ronald Reagan even though he had Secret Service protection. If de la Beckwith and Hinckley could do what they did without help from a massive conspiracy, why is it so hard to believe that Ray acted alone? But even though I am convinced that Ray pulled the trigger, I believe that he got help from segregationist groups before and after the shooting. The help could have come from the Klan or its racist ally, the National States Rights Party, then headed by J.B.Stoner. Stoner, who claimed blacks were apes and that merely being a Jew should be a crime punishable by execution, became one of Ray's lawyers. In a bitter irony, it was this virulent bigot who first promulgated the idea that Ray was an innocent dupe caught up in a vast government conspiracy that was eventually embraced by King's family. All that suggests to me that the shadowy network that was responsible for the death of Evers; the four little girls who died in the bombing at Birmingham's 16th Street Baptist Church; Schwerner, Chaney and Goodman ; and a host of other heroes is also responsible for Dr. King's martyrdom. It pains all of us to think that a saint such as King perished at the hand of a two bit punk. A historic figure like him deserved a more glorious ending. But wishful thinking can not change the facts about James Earl Ray's complicity in slaying the dreamer. Pinning the murder on the government is a delusion and a lie.